The operation of your system mainly depends on its components. It is important for you that your hardware is functioning properly in the first place. If you are shifting to another office, it is essential for you to upgrade the hardware accordingly. If your hardware is at fault, the purpose of your system becomes useless. Meet your requirements of hardware installation & troubleshooting in Dubai by contacting our experts. As a matter of fact, it is essential for you to take help from our experts at UAE Technician. It might happen that you are new to technology and you are unable to install hardware. Do not panic, get comprehensive help from us. Be it the motherboard, central processing unit or random access memory; we provide you with instant services. It is important for you to maintain the hardware components of your system. 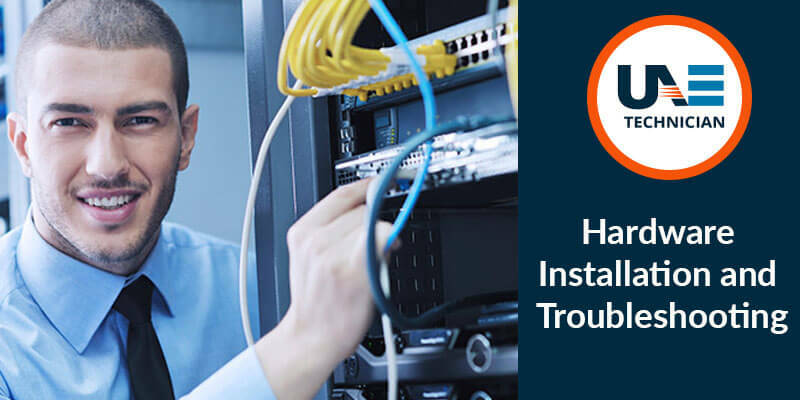 Several problems might arise while installing hardware. Issues due to electrostatic charge is dangerous as hardware is sensitive and there is a tendency of hardware failure. Additionally, there are high chances of discharging. Contacting us will not only solve your purpose but also can improve the health of your hardware. Moreover, we are providing you with reliable services that too at an affordable rate. Choosing our service is your best decision. Wasting your time in attending to hardware issues is a big no. After all, you would never want to compromise with your hardware’s functionality. Reaching our experts at UAE Technician is not a difficult task. Interact with us through phone calls and text messages. In case you are getting a busy tone on our helpline number, feel free to drop an email. We have set up live-chat sessions as per your interests. By availing this chat-session, you get a real-time experience with our experts. Irrespective of the problem you are facing, you get perfect solutions for hardware installation. Our number is open throughout the day to attend to your queries. Once you call us, our helpdesk team receives your call and conveys your message to our experts. Have faith in our services; we won’t let you down. We are waiting to receive your calls. We also provide LG PC laptop repair service in Dubai.